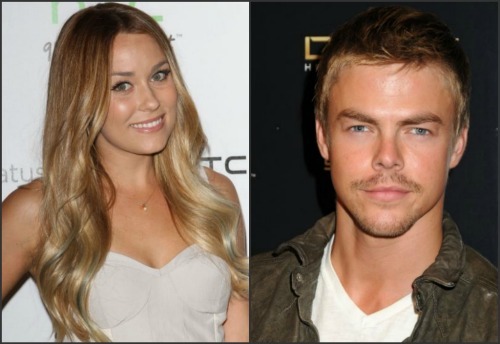 The former 'Hills' beauty and the 'Dancing with the Stars' professional are said to have been on a few dates with each other and have really hit it off. The pair went to Jason Scoppa's weekly live music show at the Sayers Club in Hollywood, where they couldn't keep their hands off each other. An onlooker told E! Online: "They were close to each other. He had his arm around her waist. They were dancing and also holding hands. "They were pretty cozy. Definitely playful and flirty." Derek was recently linked to singer Cheryl Cole while Lauren split from boyfriend Kyle Howard in June after three years together. Before they split, she revealed the couple never celebrated Valentine's Day and admitted she isn't "romantic". She said: "For me it's all about the little things that people do. I'm so not a romantic. "I don't think you need a specific day to celebrate your love for someone. I think it can be a Tuesday. It's an everyday thing."